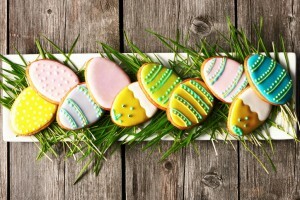 Need some new Easter treat recipes that look almost as good as they taste? Well you are in luck! We have complied a list of the most adorable, easy and festive sugar filled treats for you to try out this holiday season! Looking for the most darling and easy treat for your kids to help you make? 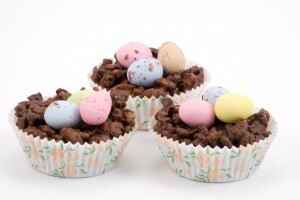 Look no further then these Rice Krispies Easter Egg Nests. These little nests will serve 16 hungry Easter egg hunters! Melt marshmallows and butter in the microwave for approximately 2 minutes. Mix the melted mixture and add in Rice Krispies. Stir until combined. Pour into greased pan and press down with wax paper. Let it sit for 30 minutes. Pipe your frosting into your Rice Krispy cups and top with your Easter egg candies. Oreo SheepThese little sheep are the perfect addition to any glorious Easter basket or could even be the show piece at your brunch dessert buffet! Kids and adults alike will love these fluffy sheep made from Oreos, white chocolate, and tons of tiny marshmallows! Pour white chocolate chips into a small bowl and microwave on high for 15-30 second increments, stirring in between, until fully melted. Dip Oreo in the white chocolate. Lift the Oreo out using a fork and allow for the excess candy coating to drip off. Set on a pile of tiny marshmallows. Press the royal icing sheep face in the center of the cookie. Sprinkle tiny marshmallows all over the cookie. Let sheep dry for a few minutes before moving it to a lined baking sheet. Repeat steps with the remainder of Oreos. There is nothing that says Easter like the Easter Bunny! Create the perfect tribute to this furry creature with the cutest cupcakes! Pick any flavor boxed cake mix you like and get to baking! Prepare cake mix per package instructions using water, vegetable oil, and eggs to make 24 cupcakes. Let cool. Cut each marshmallow in half diagonally into two pieces. Dip the cut side of each into the pink sugar. 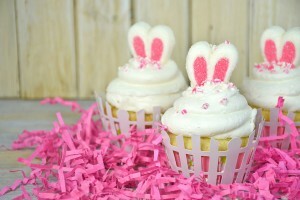 Place on the cupcake to resemble ears. Add one jelly bean into each frosting mound to create a nose. Use tweezers to place black sprinkles to create eyes. These little sugar covered chicks will have your kids chirping with joy! Add these to festive holiday goodie bags for a homemade touch, or even pack them in your kid’s lunch box to share with friends at school! Cut Starburst into 3 rectangular strips. Cut each of those in half creating 6 rectangles. Repeat this process on remaining 2 starbursts to create 24 triangles that you will make 2 cuts in each and separate them to make toes on the feet and set aside. Microwave yellow candy chips for 30 seconds stirring and repeating until melted. Lay cookie in melted candy and coat it fully on both sides. Carefully remove the cookie and let the excess drip off. Refrigerate to set chocolate, and then enjoy!